New book, 80 pages, over 200 photos. 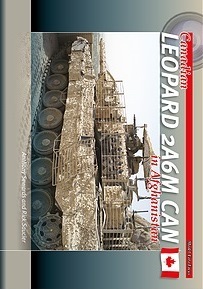 The Canadian Leopard 2A6M CAN had a baptism of fire in Afghanistan as soon as it entered service. Under the 'Tank Replacement Project' for the Leopard C2, twenty Leopard 2A6s were leased from Germany at Krauss-Maffei and Rheinmetall Landsystemes. External modiifications made in Germany included new T-shaped antenna mounts, additional glacis plate armour, slat armour on three sides, and increased mine protection in the form of belly armour and reinforcing bars under the rear hull. More modifications were applied while they served in Afghanistan. The tanks were very effective in combined arms operations providing overwatch from high-ground positions, an immediate reaction force for securing sensitive areas, or in close combat in the fields and villages.